Streaks are fun, if ultimately meaningless. We know that the Lions haven’t had a game with a 100-yard rusher since Week 13 of 2013, but at the same time, their running backs collectively bested nine different teams in PPR scoring in 2017. The former fact is amazing but meaningless; the latter is boring but actually conveys information. That was the inspiration for a graphic I made last week, highlighting the four active players who have had double-digit PPR points per game since 2009. Continuing the thought process, today I’m looking at the active streaks (of at least two years) of players (running back/wide receiver/tight end) averaging at least 10 fantasy points per game. The caveats here are obvious: This is a floor investigation, not a ceiling one. Averaging 10 PPR points a game over a season isn’t the highest threshold, but it establishes guys as at least weekly flex considerations (and it is just considerations — roughly 100 guys a year average 10 PPR points a game). A few guys who did not reach 10.0 in 2017: DeSean Jackson, DeVante Parker, Kyle Rudolph, Sammy Watkins. And streaks only tell so much — a guy averaging 10.1 fantasy points a game for 10 years in a row will appear exactly the same as a guy average 22.1. The hope is to use the 10-point threshold to identify names, and move forward from there. Since we’re predicting the future, we’ll use Magic 8-Ball responses for our answers. For the most part, there aren’t surprises here. You have the 2016 rookies (Ezekiel Elliott, Hunter Henry, Tyreek Hill, Jordan Howard, Sterling Shepard, Michael Thomas), the guys who put things together after slow early-career numbers (Davante Adams, Melvin Gordon, Marqise Lee, Ty Montgomery, Kenny Stills), and just some miscellany (C.J. Anderson, Tevin Coleman, Jamison Crowder, Adam Thielen). That leaves two names I find interesting enough to discuss further. Well, current unemployment makes it tough. Considering the lack of obvious interest in Bryant so far, the real answer is “we’ll see,” but the answer we’ll have to land on is My reply is no. Wallace is now in Philadelphia, and is at best the No. 5 receiving option in that offense. Barring a big surprise, he’s a pretty clear Very doubtful. It describes the relatively low threshold of our study that Amari Cooper still qualified despite his down 2017, but that also highlights that it shouldn’t be as hard as it is to run a streak several years in a row. Stefon Diggs, Zach Ertz, Devonta Freeman, Todd Gurley, Carlos Hyde, David Johnson, and Marvin Jones shouldn’t see their roles change dramatically in 2018, so let’s look at the other two. Ginn averaged 10.2 fantasy points a game way back in 2008, then didn’t make it again until 2015. The Saints drafted Tre’Quan Smith, who should work in largely the same deep role as Ginn, and signed Cameron Meredith and Benjamin Watson. The likelihood that the team’s running back efficiency drops off a bit in 2018 should lead to more passing attempts in New Orleans, but the best we can say for Ginn is that he’s a Reply hazy try again. As Delanie Walker ages, his targets are likely to fall off, but the arrival of Dion Lewis and expected improvement from Corey Davis should more than offset that. Matthews isn’t likely to be a monster this year, so Outlook not so good. I’ll eliminate the guys who are likely to repeat straight away: DeAndre Hopkins, Doug Baldwin, Mike Evans, Odell Beckham Jr., and Travis Kelce all maintain their roles in their offenses, and assuming health, there’s no reason to think they won’t run it back. Assuming the Tyrod Taylor/Baker Mayfield combination doesn’t fall flat, the Cleveland offense should compete with the Chicago one for the title of most improved attack in 2018. Landry will have to compete with Josh Gordon, Duke Johnson, and David Njoku (among others), meaning his overall target load might fall, but he still has a comfortable cushion to repeat. He’s a Signs point to yes. Miller has disappointed in Houston, but he hasn’t been an outright disaster, and has even had stretches of fantasy productivity. Odds are, this will come down to D’Onta Foreman’s health. Foreman was breathing down Miller’s neck in 2017 before tearing his Achilles. If he is healthy for training camp, as has been rumored, he could overtake Miller as early as Week 1. If he isn’t healthy, there isn’t a lot of other competition for Miller’s work. He’s Ask again later. Ingram’s four-game suspension doesn’t hurt him on its own, since we’re discussing per-game average, but if the team’s reaction to Willie Snead’s 2017 suspension (and its drafting of Boston Scott) is any guide to go off of, Ingram might not find himself with the same level of workload after his return. Don’t count on it. Who is the No. 1 receiver in Los Angeles? Is it 2017 breakout Robert Woods, 2017 rookie Cooper Kupp, or new arrival Cooks? If it’s Cooks, he’ll make it. If it’s one of the other two, he’ll have a tougher road. Concentrate and ask again. There are only four players working on active streaks of exactly five years. Keenan Allen and Le’Veon Bell look about as safe as players can look. Alshon Jeffery is less certain, but as the No. 1 option for the defending Super Bowl champion, we’ll give him a pass as well. That leaves us with one question. Maybe I’m alone, but I see the end coming for Walker, who will be 34 when the season starts. His yards-per-target and yards-after-the-catch averages both hit four-year lows in 2017, and with Corey Davis, Dion Lewis, and 2017 rookie Jonnu Smith around, Walker’s odds are dropping, making him Outlook not so good. Golden Tate is as safe as anyone comes in PPR leagues these days, while T.Y. Hilton still managed to average 11 fantasy points per game even without Andrew Luck in 2017. They’re safe, leaving one question mark. Surprise, right? Cobb was the biggest surprise for me throughout this, and while his fantasy average has fallen steadily since 2014, he now finds himself as the No. 2 receiver in the Green Bay offense again, thanks to Jordy Nelson’s departure, and if you assume Aaron Rodgers stays healthy, Cobb is a Signs point to yes. After only a few names on five- and six-year runs, the seven-year crowd is bursting at the seams, thanks to a huge 2011 rookie class that includes A.J. Green and Julio Jones, second-year breakouts from Antonio Brown, Demaryius Thomas, and Jimmy Graham, and Rob Gronkowski missing the mark in 2010 by a quarter of a point per game. There are two names here I’m looking at. PPR isn’t kind to Graham these days. He had 85-plus catches four years in a row in New Orleans 2011-2014 before being shipped to Seattle, where he never topped 65 across three years. Sixteen touchdowns the last two years kept Graham fantasy-relevant, and now he heads to Green Bay, where he should be a red-zone threat for Aaron Rodgers. 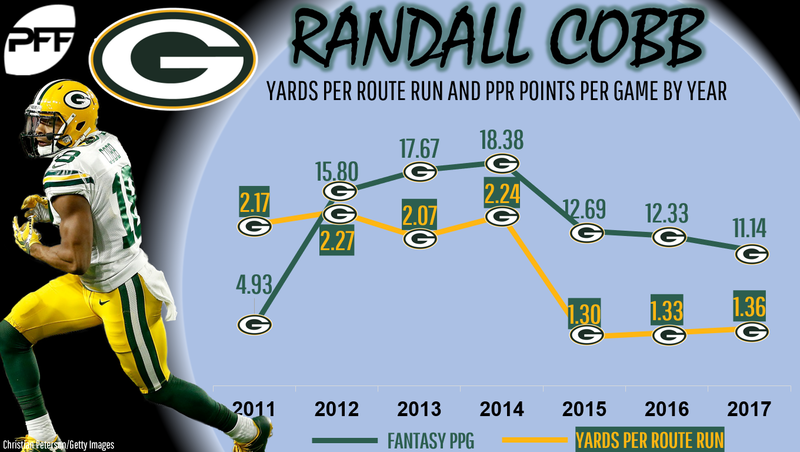 Still, with Cobb, Davante Adams, and a whole host of potential high-ceiling No. 3 receiver options, Graham could certainly use to offer up more for PPR. He’s got a shot, but Don’t count on it. Like Dez Bryant so many paragraphs above this, Murray doesn’t even have a job for 2018. Unlike Bryant, it makes more sense that Murray would be struggling to find work, as a 30-year-old running back with over 2,000 career touches. It’s admittedly a bit surprising he hasn’t landed anywhere as a backup, but even if that happens, his spot on this list is probably dead, making his chances My sources say no. Do I need to discuss LeSean McCoy’s fantasy stock? Okay, moving on. This past season was the second-lowest-graded of Crabtree’s career. He signed with a Baltimore team that has overhauled its receiving corps this offseason, bringing in Crabtree, John Brown, and Willie Snead, and drafting Jordan Lasley and Jaleel Scott. The only one there remotely approaching a sure thing is Crabtree, who will open the season as the No. 1 even if he no longer has the pedigree of a top receiving option. Simple workload means Most likely. I was surprised to see Garcon in these ranks as well, but he has managed the trick every year back to 2009, his second year in the league. You could argue he hasn’t been a sure thing to make the list at any point in his career — last year was maybe his only year as a team’s clear No. 1 target, and he entered the season with Brian Hoyer and C.J. Beathard as his quarterbacks — but he keeps showing up. Now again his team’s No. 1 and with what appears to be a very good quarterback at the helm, we have to bump him to You may rely on it. I love that Gore hasn’t been a top-tier running back in almost a decade, but he’s finished the year as a fantasy starter-level producer without fail. It’ll be a neat trick in 2018, though, as he’s behind Kenyan Drake in what is suddenly a crowded Miami backfield, with Kalen Ballage in the fold. It’s sad, but Gore is a definite My reply is no. Larry Fitzgerald is so good, you guys.